We had a long weekend in honor of Labour Day and Wesak Day (a Buddhist holiday). Mitch and I left the planning too late, so I flew down to Singapore for the weekend. If we’re still in Asia next year, we will make it a point to know when the holidays are! Just like in the US, if you want to travel on a holiday weekend, you book your travel months in advance before prices increase and availability decreases. As you might know, this was my sixth trip to Singapore. (You can find my notes on previous trips here, here, here, here, and here.) Each time I go, we spend less time in tourist land and more time just doing normal things like a normal couple who lives in the same city. We run, we buy groceries, we go for walks, we hold hands. When Mitch visits me, we spend a lot of time cooking because that’s something he can’t really do in Singapore. (Seriously, people, it’s the little things.) This time, though, we did two touristy things! 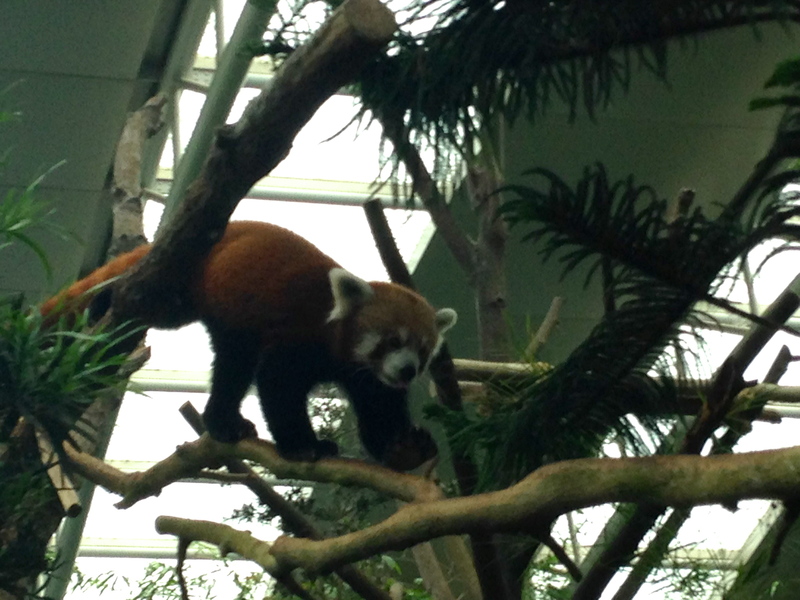 Singapore has a really amazing zoo with multiple parks. Last time I was in Singapore, we went to the Night Safari with Mitch’s mum. This time, we went to the River Safari, which is a really interesting concept. It’s basically a zoo and educational center built around the world’s major rivers – Nile, Amazon, Mississippi, Yangtze, Congo, Mekong, and Ganges. Very cool and I highly recommend it! 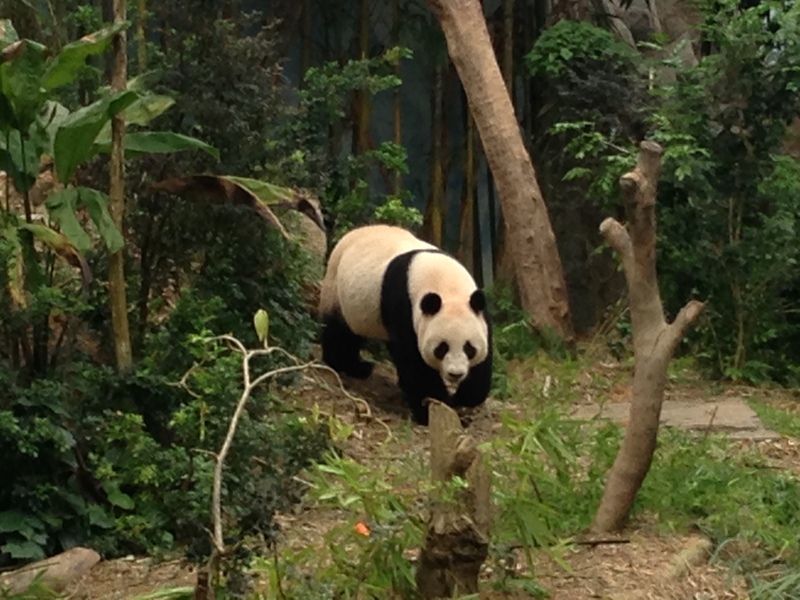 Another cool thing about the River Safari is that they have pandas! One was hiding, but two were out and about! 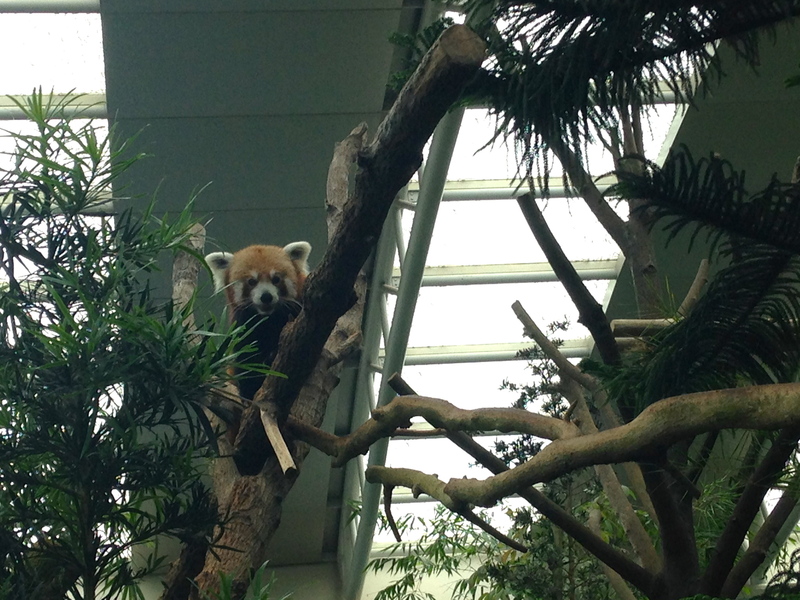 Adorable red panda! I didn’t know they were so small. It was climbing and running and jumping around like a squirrel. I wonder if they’re related? 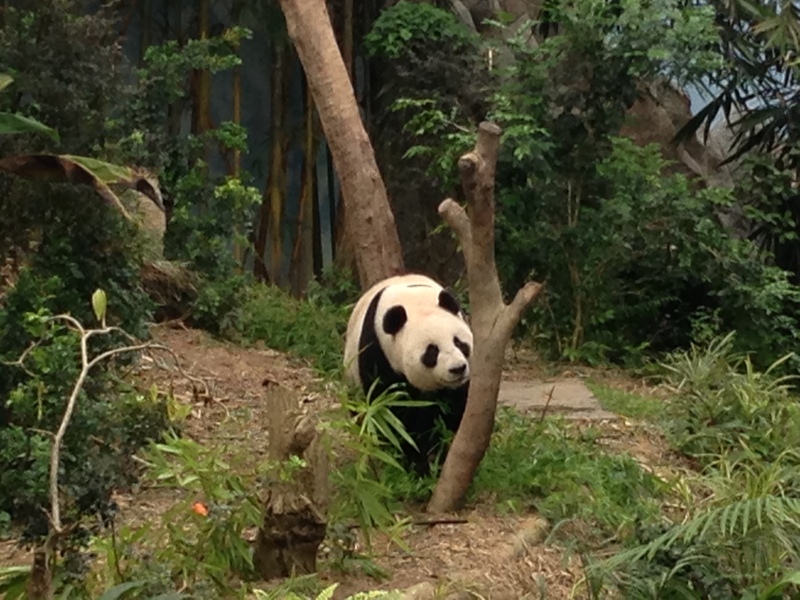 This panda started out hiding behind a rock but we got lucky! 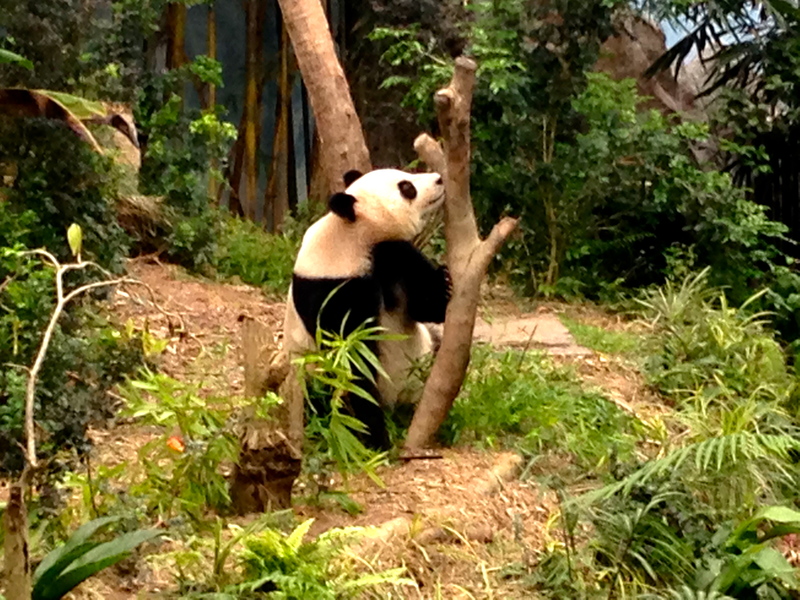 “Lumbering” is honestly the best way to describe this panda . . . they are very large, larger than I expected. I just thought this was a cool shot. The other touristy thing that we did actually might not even count as a tourist thing.There’s a reason people go to Singapore for urban life and to Thailand, the Philippines, Indonesia, and Malaysia to go to the beach! That’s what Mitch and I wanted to do, but we couldn’t afford it by the time we figured out it was a long weekend. Singapore is not known for its beaches, and that’s for a good reason. They’re man-made and on the Straits of Johor, a major shipping lane. The horizon is blocked by oil refineries. The sand isn’t soft because the ground underneath it isn’t real. There aren’t crashing waves, either. But Sentosa’s beaches did give us a day to walk along the sand, pop in and out of the water, and take in a ukelele festival complete with food trucks. (Get this: There was a coffee food truck. Amazing.) A Singaporean we met at a party this weekend told me that going to the beach on Sentosa was a nice way to spend a day about once a year. She’s right. I didn’t even take pictures! Sentosa made me miss childhood summers on Myrtle Beach something fierce, but I was glad we went. There’s just something about sun and sand and water that has always put me in a very happy place. As always, Mitch and I had a wonderful time together. Hopefully soon, I’ll be able to stop saying that because it won’t be news. More travel is in the works! I’ll keep you posted. Thank you for posting this, Rebecca. As always it so interesting and fulfilling to learn what you and Mitch are up to.